Having managed to convert my Crusader Kings II save to Europa Universalis IV and now being happy that the game world represents my interpretation of it from CKII, I’m ready to continue with my world conquest, however that might progress, in this Paradox Let’s Play. 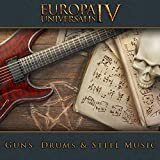 Before unpausing the game, there was a lot I had to get to grips with as a newbie to this game, including EUIV rivals and enemies. 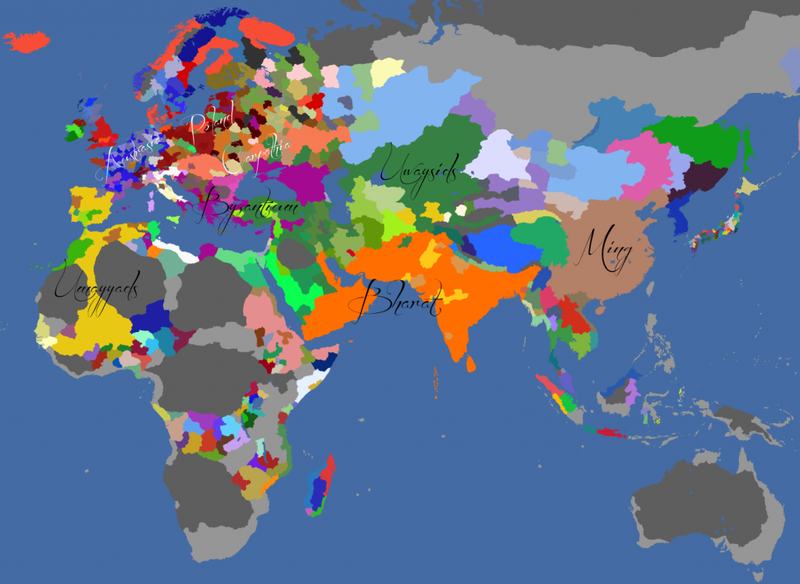 You might find this post particularly interesting and helpful if you’re also new to EUIV. I’ll explain in very simple terms some of the mechanisms that I had to deal with before unpausing the game and link out to more detailed explanations elsewhere on the Internet. Make sure to have a look at my previous post to see how the game world in this alternate history compares to the normal starting situation in EUIV. 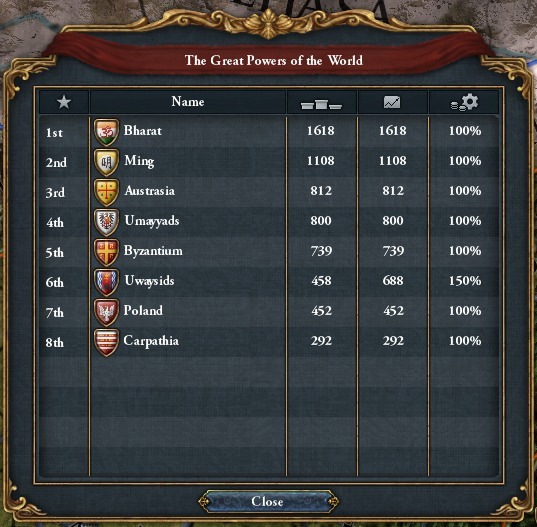 There is a concept of “Great Powers” in EUIV, which are sort of the equivalent of “superpowers”, as we refer to them in the real world. These are the top eight most developed and technologically advanced countries in the world. 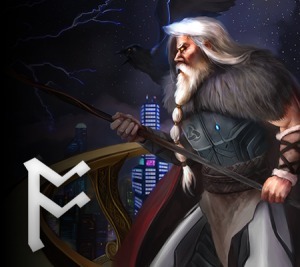 As a Great Power, you gain some passive bonuses as well as extra diplomatic abilities, such as the ability to Take on Foreign Debt, which means you pay off all debt of the target country, improving relations between the two countries (as well as some extra bonuses). So I expect there to be a little bit of historical crossover in this game compared to a standard one. Except for me (Bharat), of course. I’m already close to 50% stronger than the usual #1 Great Power, Ming, and represent an early counterbalance to their expansionism in the East. Old World map showing the Great Powers of 1444. In Europe, it can be difficult to distinguish Austrasia and Poland because they have a number of vassals due to the CKII > EUIV conversion. “Rivals” and “Enemies” are two important concepts in EUIV international relations. They’re closely related, but not the same. You can choose up to three rivals, whereas an “enemy” is another nation that has designated you as a rival. In other words, you’re able to select your rivals but not your enemies. You can’t just choose any country as your rival; they have to be of comparable strength. Choosing rivals gives you some bonuses, including improved espionage capabilities against that rival and being able to grab more territory from them when suing for peace. For me, there were only three countries that I could choose from as rivals because I happen to be the number one Great Power. These were interestingly not just positions 2, 3, and 4 in the list of Great Powers (shown above), but Ming (2), Umayyads (4), and Byzantium (5). I think this is because army and navy sizes are taken into account, which aren’t taken into account to determine whether or not you’re a Great Power. These three also happen to be my enemies, so we’re all reciprocating each other’s hate. How nice. Trade is a big deal in EUIV. I’ll concentrate on this more in my next post because it’s quite involved, but needless to say, the geographic extent of Bharat puts me in a very good position to exploit trade around South Asia. I can issue trade embargoes against any country, but doing so comes with a penalty to me unless that country is a rival. What this means is that you should probably embargo all of your rivals, which I do so with fervour against Ming, the Umayyads, and Byzantium. Given the way that trade works, this is only likely to impact Ming at this point, as the other countries are just too far away. Standing armies are a thing in EUIV. Coming from CKII, where any sort of standing army was a late-game concept (with the likes of retinues and permanent mercenary groups), it took me a while to wrap my head around this, but it makes sense in EUIV’s context where it tries to capture the “rise of the nation state” as a concept. In 1444, my army has 72,000 men. Looking at my score, I can see that I’m 1st overall, though the breakdown reveals that I might want to take another look at my military – 1st in Administrative rank, 1st in Diplomatic, but 4th in Military. The game is still paused at this point. I’ve taken a moment to examine the world around me and who are likely to be my immediate competitors. It’s time to start looking inwards. As with any Paradox game, the options available to me are many. Thankfully, the prompts are well-placed and I’m able to direct my attention the parts of my empire that need it. First up is hiring some advisors. Advisors provide passive bonuses and add to your Monarch Power, but cost a certain amount of ducats per month. Monarch Power represent a type of “influence” that let you take a myriad of actions in the game, and stop you doing more-or-less whatever you want. I like to think of it as a sort of political influence. It’s separated into three types: Administrative, Diplomatic, and Military. Advisors in EUIV come in all shapes and sizes. There is a base generation of MP. On top of this is added MP generated by your monarch and MP generated by all of your advisors. 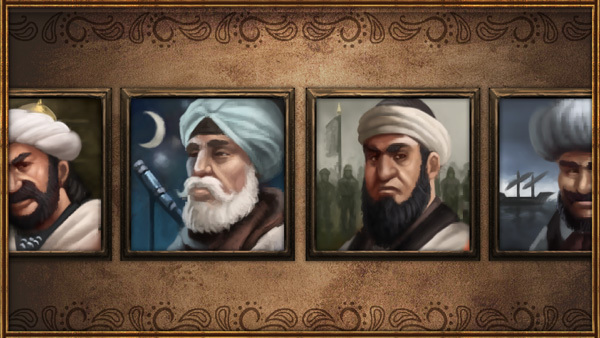 Bharat is pretty wealthy, so I hire the best advisors available to me. My monarch is also quite skilled (thanks to generations of eugenics in CKII), so in total I’m gaining 10 Administrative, 11 Diplomatic, and 11 Military MP per month. (This is normally represented as 10/11/11.) This gives me lots of freedom to exert power within and outside of my empire. National Decisions are important “destiny-defining” decisions that will impact the future of your country. They’re just as much a role-playing tool as a game mechanic. 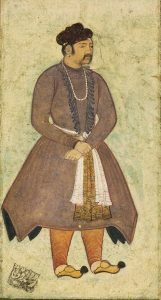 The Din-i Ilahi was a syncretic religion propounded by the Mughal emperor Akbar in 1582 AD, intended to merge the best elements of the religions of his empire, and thereby reconcile the differences that divided his subjects. This gives me a permanent -6% technology cost, which will certainly add up over the course of my campaign in EUIV! There are up to three so-called National Missions available for you to choose from at any given point. National Missions will have a goal and a reward if you complete this goal. You can only select one active National Mission at a time. They’ll normally be relevant to your current situation and provide you with a little guidance, should you need it. Given that they’re relevant to your situation, they quite often align with your personal goals, too. It can often be a good idea to be pursuing one at any given time just for the rewards. Bharat takes an easy National Mission to start, which involves converting the province of Assam to Hiduism. This involves sending one of your Missionaries – a type of “Envoy“, which is an agent allowing your country to undertake certain actions – to convert the province. It will take a certain number of months. Hindu nations are able to select from a number of personal deities when a new ruler takes the throne. I select Surya, the solar deity in Hinduism. This increases Bharat’s National Tax and Trade Power by +10%. In other words, it’s a solid economic option. 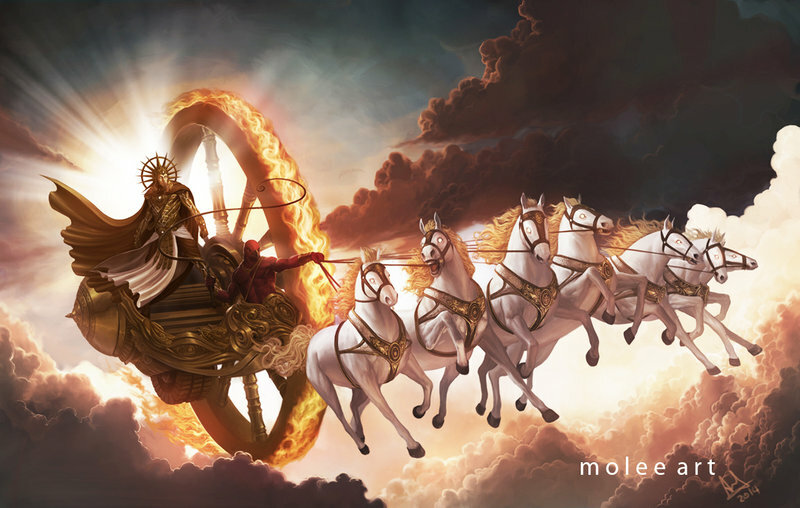 Surya, God of the Sun. See more by “molee” on DeviantArt. Well-selected personal deities can be an important component of success in the coming decades. Obviously, one expects the ruler to be around for some time, and one can’t just choose willy-nilly when a ruler will die. The personal deities can therefore be chosen very opportunistically. It represents an opportunity to refocus your country towards a certain goal. If you see war in your near future, for example, it might make sense to pick an appropriate deity, such as Shiva or Shakti. Estates are factions within the nation that can influence domestic politics. Keep them sweet, and you’ll experience passive bonuses. Neglect them, and you’ll know about it. However, there balancing act is complicated by the fact that their relationship to you is measured on two axes: loyalty and influence. Too much influence, and estates might start to get uppity. One of my estates is demanding more provinces to fall under their control right from the start. They need at least 10% of all my provinces to be under their control. For a while, I was a bit baffled by how to do this, because not all of my provinces could be granted to them. Of course, I was looking for the least developed provinces, but these were often at the edges of my empire. It turns out that EUIV has a distinction between what it calls “States” and “Territories”. The way I like to think about this is that States are part of your empire-proper i.e. you’ve made a decision at some point that they will be economically beneficial (or beneficial by some other means) and have brought them under direct rule. Territories, on the other hand, have a higher level of autonomy and don’t fall directly under your purview. As your empire grows, you’ll find an increasing amount of your provinces will be located in Territories rather than States. The reason I say all of this is because you can only gives provinces within States to your Estates. This is a little frustrating because you have to flip between two map-modes if you want to give economically lacklustre provinces to your estates; you first need to see which provinces belong to States in one map-mode, then switch to the Development map-mode to find the poor ones and figure out the overlap. You get used to it soon enough, and the State/Territory distinction thankfully doesn’t come up much in the future. I’ll mention it in future posts when it becomes important. I’ve got to grips with a lot of important game mechanics before unpausing the game, but soon the world will be in motion and I’ll have to react to whatever world order has emerged out of the Middle Ages. There are lots of knobs to turn when it comes to a country’s economy, and I’ll try tweaking a few of them. It’ll turn out that trade is a very important component of Bharat’s economy, and it’s a system that’s worth wrapping one’s head around early for maximum lasting benefit.